The big question is which will be the bigger draw??? 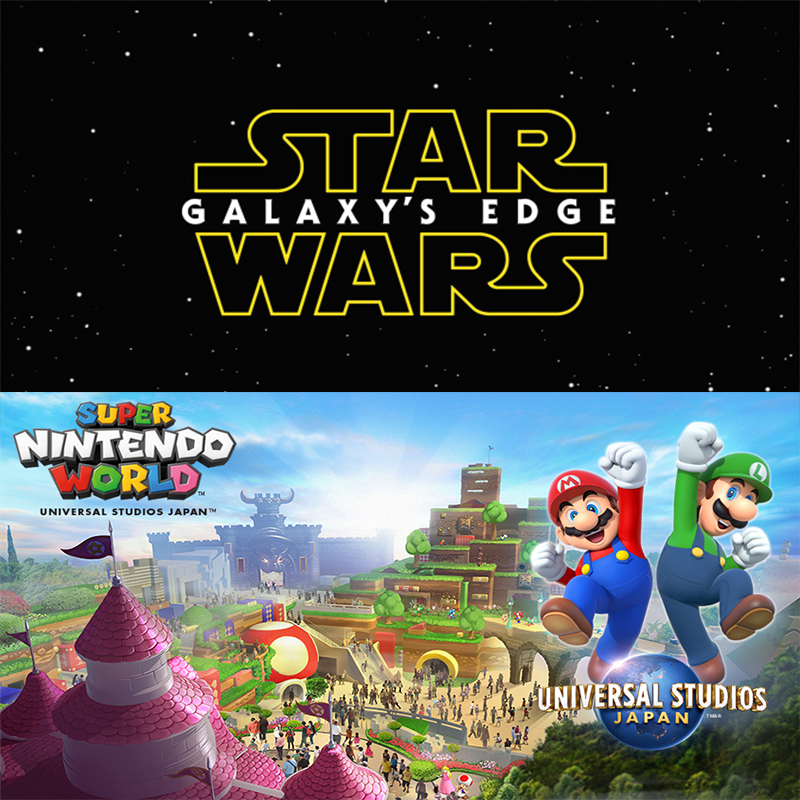 Although it first debuts in Tokyo for the 2020 Summer Olympics, Universal Studios Japan’s Super Nintendo World is one of the most highly anticipated theme park expansions, rivaled only by Star Wars: Galaxy’s Edge (Star Wars Land) at Disney parks in the US debuting next year! Two enormous intellectual properties (IPs) that will undoubtedly drive up guest attendance by exponential amounts. But which will prove to be the more popular expansion? Arguably, both lands will significantly impact the attendance of, character meet-and-greets in, and merchandise of the parks. The competition is heating up between Universal and Disney parks and resorts–reminds me of the US and Russian space race of the mid-1900s. While there is no doubt that both lands will be major successes, therein lies a question of which one will prove to be more popular. Not that it truly matters in the grand scheme of things, but it’s one of those things that is interesting to talk about and synthesize some research. After the opening of both Wizarding World of Harry Potter (WWoHP) lands at Universal Studios Florida (and subsequently the Hollywood expansion), it was no surprise that Disney World was running to catch up, hence the opening of Pandora: the World of Avatar. As amazingly beautiful and detailed as Pandora is, it has not managed to draw the continued crowds and fandom that the WWoHP has been doing since 2010. According to the website Touring Plans, the increase from 2015 to 2017 attendance at Animal Kingdom rose marginally on the average whereas the Miami Herald reports that the increase at Universal Orlando during this same time period was more significant, and the forthcoming TEA Connect and AECOM reports are predicted to show greater growth at Universal than Disney World. Suffice it to say, the fanbase for Harry Potter far exceeds that of Avatar; however, the great battle for the crowds is currently between Star Wars: Galaxy’s Edge combined with Toy Story Land and Super Nintendo World with further Harry Potter/Fantastic Beasts developments in the works. To understand which is likely to out-perform the other, one has to delve into the individual fanbases and economic impact of both properties primarily in question–Star Wars and Nintendo. Unfortunately, there is little to no empirical way to quantify the number of fans either property has because of all the variables. Furthermore, movie ticket DVD/BluRay/VOD sales cannot be weighed against video game console and interactive media (video games) sales to determine fanbase size because it would not be an equitable means of measurement. Understanding the fanbase is crucial to predicting which property will be the bigger draw, which will have the biggest economic impact on its respective park. At the end of the day, both expansions are winners. Both will prove to provide vast positive affects upon the parks. Still, the friendly competition gives rise to the question which will be the bigger success. While the number of fans cannot be realistically quantified, the amount of revenue generated by Star Wars and Nintendo CAN be quantified, and that is precisely what Statista does. According to Statista (and the more than 18K sources from which the company compiles the information), Star Wars has generated $7.5B in revenue compared to Nintendo‘s $75B. What??? Yes, that’s right. Nintendo exceeds Star Wars in revenue 10x. While Nintendo may far exceed Star Wars in revenue generation, it’s important to note that Star Wars is the leading movie franchise in terms of merchandise sales. Yes, more than Harry Potter (and I’m house Ravenclaw). And merchandise sales is a HUGE component of theme park operations and sales. Since park guests base their visit on more than just a single land, the presence of Toy Story Land at Disney World and Wizarding World of Harry Potter should also be taken into account when determining whether Disney World or Universal Orlando will see the bigger boost to attendance and increase in revenue. Arguably, Harry Potter (inclusive of Fantastic Beasts) is the bigger franchise family based on book sales, ticket sales, current theme park attractions, etc. Therefore, Star Wars land has to be big enough to not only compete against Nintendo World but also Harry Potter. One of the biggest advantages that Star Wars has over Nintendo and Harry Potter is merchandise sales and collections. Star Wars has exponentially more memorabilia and collectors than Nintendo, mostly because of the success of the films and the fact that Star Wars predates Nintendo by several years. But I imagine that Universal will continue to rely upon WWoHP for the bulk of the merchandise sales at the park since it can compete with Star Wars Land on that playing field. Analyzing the fandom of Nintendo is a little more difficult than that of Star Wars because Star Wars is the big umbrella under which all the movies, video games, and merchandise fall. Fans identify themselves as a Star Wars fan, whereas the fans of Nintendo’s product line are more prone to identify with a particular game franchise (Mario, Pokemon, Zelda, etc) more so than identifying with Nintendo proper. All evidence points to both brands being strong, viable candidates that will provide a close competition. Both Star Wars and Nintendo are worldwide phenomena–no question. Combine Star Wars with Toy Story and conversely Nintendo with Harry Potter, and you have two powerhouse destinations for theme park fans. With the recent expansions at Universal Studios Florida and Hollywood, Disney World/Disneyland needs to ramp up their game–go into hyperspeed. Star Wars: Galaxy’s Edge pulls into space dock in 2019 just in time for episode IX. We are still a few years away from a domestic Super Nintendo World, and do not know much about it; however, we do have an idea of what to expect at the Universal Studios Tokyo and can by extension apply that knowledge to Universal Orlando. From what we know so far, Star Wars land will be a completely immersive environment that will essentially transport park guests to a “galaxy far far away.” If the WWoHP is the best example of the successful translation from book to screen to theme park for a world of fantasy, then Star Wars land will be on par with the best. An interesting element to think about is the future of both Star Wars and Nintendo. It’s old news at this point that the most recent Star Wars movie The Last Jedi was not popular with longtime fans–new fans, yes–longtime fans, no. Nintendo is successfully holding onto both the old and new fans because the video games and consoles continue to appeal to those who had an NES as a kid or just bought last year’s Switch. Even legacy properties are holding onto what made them popular, but incorporating trends in interactive media (the term now often used to define that which was formerly video games). Mario Builder is an example of the aforementioned concept. If Star Wars continues to lose its longtime fans, abandons them for the new fans, then the new land may not fair as well as Nintendo World. Fantastic Beasts and Where to Find Them was a new generation Harry Potter movie that largely appealed to BOTH the old and newer fans. Therefore, it could be said that Universal Orlando’s most popular themed lands may have a longer life than Star Wars if the movies keep dropping the older fans. Just something to think about. The Battle of the Parks is hot, and will just keep getting hotter! Fortunately, healthy competition breeds innovation, so whether or not Universal or Disney has the better new land expansions, the real winner in this battle is the consumer! Both parks will greatly benefit from the expansions and only time will be able to tell which one wins this race to be the best.